A couple of months ago I gave a little review of the Spot Generation 3 “personal locator beacon”, which I like quite a bit due to its smaller size relative to predecessors. It’s a solid unit that works as advertised. Here’s the thing though, there’s something better. 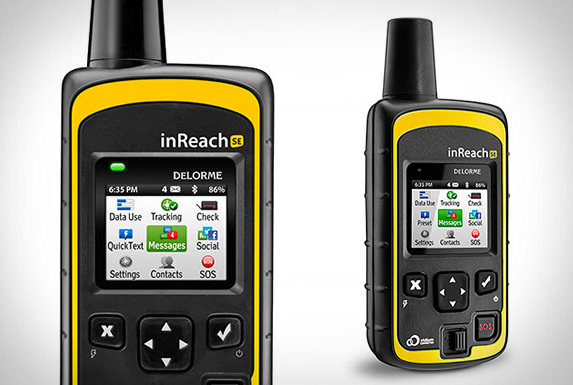 If you’re the type of person that likes going deep into the wilderness to catch your fish, you need to do yourself a favor and check out the new inReach SE Satellite Communicator from DeLORME. It’s an incredible little piece of equipment that also does what it advertises. Namely, it lets you text from basically anywhere on the planet with whomever you choose, as well as getting texts back. I’ve been testing the inReach unit just around town, but haven’t had problems with any of the functions at all yet. Pair with your mobile device to access downloadable topographic maps, NOAA charts with the Earthmate app when out of cellular service. I do plan on testing this weekend on a remote back-country ski trip and will follow up with any features I particularly like or any issues I might find with it. So far the thing has been a breeze to use and the battery life is amazing.